Derek Diedricksen has always had a love for small, modest houses ever since his father gave him the book "Tiny Tiny Houses" by Lester Arthur for his tenth birthday. Combining his artistic abilities, wild imagination, and his passion for small houses, he self-published "Humble Homes, Simple Shacks, Cozy Cottages, Ramshackle Retreats, Funky Forts, and Whatever the Heck Else we could Squeeze in Here" in 2009. 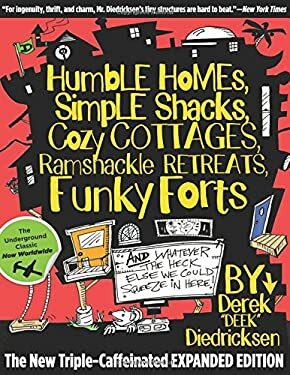 This book is a collection of Diedricksen's creative/imaginative sketches for building small houses, shacks, cottages, and forts. The sketches are accompanied with hand-written commentary, both instructive and comical. Derek's main purpose is to get your creative juices flowing and encourage you to get off the couch and use your hands. He believes that specific building plans squash creativity and so avoids too many detailed instructions, giving you the chance to put your own creative spin on your very own small abode (even if it is just in your imagination).